Most know that mold is harmful, but don’t really understand why. Simply put, mold is a fungus that produces allergens, irritants and, in some cases, potentially toxic substances. Inhaling or touching mold or mold spores may cause allergic reactions in sensitive individuals, including hay fever-type symptoms, such as sneezing, a runny nose, red eyes and a skin rash. Additionally, mold can result in asthma attacks and can irritate the eyes, skin, nose, throat and lungs of both mold-allergic and non-allergic individuals. Mold spores are very easily aerosolized, and once they are disturbed, hundreds of thousands of spores can fill the air within a short period of time. Because of this, containment procedures are necessary to prevent contaminating the entire house or building. While some mold spores are clearly visible and sometimes have a smell, mold can also grow between walls, under floors and ceilings, and in attics or basements, and sometimes won’t be detected until a proper inspection is performed. But by the time it is detected, a mold diagnosis can get ugly because both parties are heavily invested in the sale. A savvy seller should put a mold disclaimer into their real estate sales contract that suggests the buyer hire an independent mold inspector to have the home tested. Understand that it’s not the job of an inspector to search for mold, but there are tell-tale signs, such as water damage. Always ask the inspector if they saw any potential mold problems in their search, even if it’s not in the report. 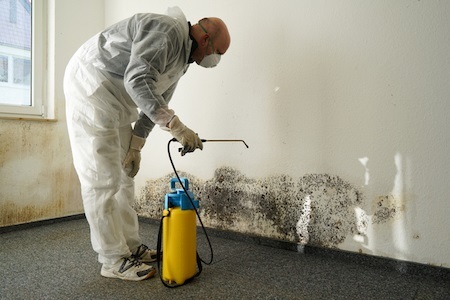 If you do find mold infestations behind walls or in ceilings, it’s always best to contact a mold cleanup professional and let them handle the problem. Don’t lose a sale because you didn’t want to spend the money. Most likely, if the buyer still wants to buy the home with the mold, the price would need to drop considerably anyway. It’s better to fix the problem yourself.